Until July 15, all mesh items 50% OFF! 50% OFF – SALE AT MESH DEPARTMENT, originally uploaded by Fhara Acacia. TREND Issue June 2012 Cover, originally uploaded by Leandra Breen. Here it is, the June Issue of TREND Fashion & Lifestyle Magazine! WHAT: Fashion Party in NYC. Meet the Designers. Get free gifts. WHY: We invite you to New York City to experience an event with two of SL’s top makeup and clothing designers. New York City is hosting an event and collaboration between PIDIDDLE and *BOOM*. Fashionistas and glamourous socialites will all be in attendance. Bring a friend or two at these amazing store while partying hard with SL’s finest. You may even land on the front page of NYC’s Online Magazine! For VIP access, IM Amalia Foxtrot. To stay on top of New York City News & Events, don’t forget to join us only by registering at www.newyorkcitysl.com! Come accaduto per l’Abruzzo e per il Giappone, alcuni designer e i musicisti di Second Life desiderano mandare il loro contributo alle popolazioni dell’Emilia colpite dal terremoto. Il 5 e 6 giugno MIC – Imagin@rium & Atlantide Arts Exhibition hanno ospitato un CONCERTO LIVE di Lollo String, Viviana Houston e Ridha Ibrahim, il cui ricavato sarà devoluto interamente all’Emilia, tramite Roma Capitale che ha aperto un conto corrente apposito per la raccolta delle donazioni alle vittime del terremoto. Nelle stesse date si svolgerà a Roma il 21° IDC World Congress (Roma Intercoiffure 2012) un mega-evento in cui i giovani protagonisti dell’hairdresser esprimeranno le loro idee, presentando la loro creatività e contribuendo al continuo ed intelligente evolversi delle tendenze. MIC – Imagin@rium si affianca all’iniziativa, presentando le proposte di alcuni designer di Second Life, che dal 9 al 13 giugno metteranno in vendita le loro creazioni alla Domus romana con un piccolo sconto, e il cui ricavato sarà devoluto interamente all’Emilia. Gli stilisti parteciperanno alle riprese di un video-machinima che verrà in seguito pubblicato sul sito dell’Intercoiffur. As happened in the Abruzzo and Japan, some designers and musicians in Second Life want to send their contributions to the populations affected by the earthquake of Emilia. On June 5 and 6 MIC – Imagin @ terium Atlantis Arts & Exhibition hosted a LIVE CONCERT Lollo String, Viviana Houston and Ridha Ibrahim, whose proceeds will be donated entirely to Emilia, via Roma Capitale has opened a special bank account for collecting donations for the earthquake victims. In the same dates will be held in Rome on 21 ° IDC World Congress (Rome Intercoiffure 2012) a mega-event in which the young protagonists dell’hairdresser express their ideas, showing their creativity and contributing to the continuous evolution and intelligent trends. 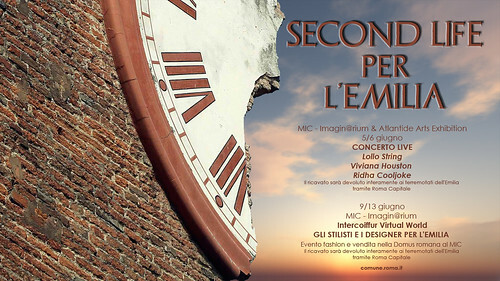 MIC – Imagin @ auditorium joins the initiative by presenting proposals for some of the designers of Second Life, June 9 to 13 that will put their creations for sale to the Roman Domus with a small discount, and proceeds will go entirely to ‘Emilia. The designers will participate in the filming of a video-machinima that will be subsequently published on the site dell’Intercoiffur. Do you always style to the nines between different designer’s to create a one of a kind look? Is styling uniquely your claim to fame? Then the SoloEvane Model Agency with the help of our sponsors Blacklace, Chop Zuey, Gizza, Les Petits Details *LpD*, and *SoliDea FoliEs* are sponsoring a grid wide Mix and Match modeling contest and model search. Men? You are strongly encouraged to participate. For the first round you will need to create your unique style using the above five designers. Don’t stay with one, use as many as you can, because the contest is about blending to create outfits that are uniquely YOU. 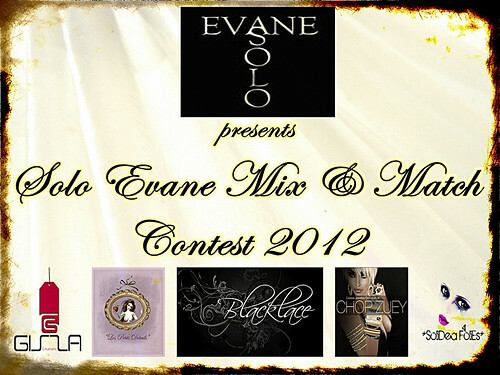 The SoloEvane Mix and Match Contest 2012 has two stages. First stage is to style your unique look and send the picture. Second stage is a live walk off in front of the judges and audience. On June 17th 2012 at midnight SLT, we will close the contest to new submissions of pictures and our sponsors and Solo Evane executives will choose the finalists for the final round of the event which will be held on June 24th 2012.
Who wins it and Whats in it for you? – First Place: 12500 L$ in cash and giftcards from our sponsors and will be invited to join the Solo Evane Modeling Agency. – Second Place: 7500 L$ in cash and giftcards from our sponsors. – Third Place: 5000 L$ in cash and giftcards from our sponsors.